As I’ve mentioned a couple times now, Kevin and I are newlyweds. We are still reveling in the post-wedding glow—reminiscing and tying up loose ends, like ordering photos and finding the perfect cupboards, drawers and hooks for the bounty of kitchen-bound wedding gifts we received. These sporadic wedding-related tasks stand in stark contrast to the months leading up to the wedding, when The Wedding completely consumed my life. As I’m sure many who have recently planned a wedding would agree, the wedding industry can be a terrifying thing. In the early weeks of our engagement, I felt as if we had been plunked down on some kind of wedding industry conveyor belt. I quickly realized that the easiest response would be to hang on for the ride. Still, I resisted the cookie cutter approach that many planners, florists, etc would push on us. I found the most satisfying way of doing this was to make whatever I could myself. So, I did the next best thing. I determined to bake the cake and host a welcome BBQ the Thursday night before our Saturday wedding. Both plans caused many people to think I was completely nuts. Thankfully, both my fiancé and my mother barely batted an eyelash when I announced these decisions. In an effort toward sanity, I resolved to make the BBQ’s guest list as condensed as possible and began creating and editing the menu months in advance. Likewise, I began researching wedding cakes very early on (before settling on a wedding dress, of course). I quickly realized that cupcakes would be the most feasible and fun option. However, because I didn’t exactly envision multi-colored sprinkles or canned frosting, I scoured recipes for months. Several blogs—Cupcake Bakeshop by Chockylit in particular—were quite helpful and inspirational. I also dog-eared every wedding magazine layout featuring a tasteful cupcake display. 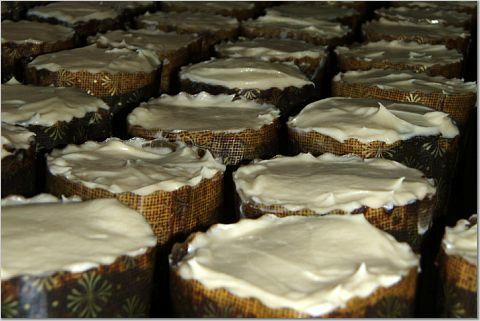 I settled on recipes for the cakes (from blog Alpineberry) and the frosting (see below), and tested and re-tested them. I tried a variety of cocoas in the cakes (ultimately settling on Scharffen Berger) and I experimented with various stabilizers in the frosting (anticipating hot weather for our outdoor August wedding – good thing, because temperatures on the big day neared 90 degrees). I carefully multiplied the recipe’s quantities to craft a grocery list and procured all the ingredients well in advance of the wedding weekend (I was the person who actually bought those impossibly enormous bags of powdered sugar and boxes of baking power at Costco). Throughout the engagement, countless people said “I can’t believe you’re making your own cake!” In the end, that statement was far from true. Many others were involved as well. My fiancé was my loyal taste-tester. My sister helped in my search for wedding-worthy cupcake liners (when I found an online purveyor of these gorgeous mini-Pannettone liners, I was sold). My mom constantly reassured me and identified potential problems well ahead of time. And then there’s my stepdad, who built me the most gorgeous stand for the cakes I could’ve ever imagined. Heck, even the Best Man got in on the action, keeping me company when I started the baking at 6 AM the morning after the BBQ we hosted. The plan, if I do say so myself, came off without a hitch. The cakes themselves were delicious (again, so I heard) and the stand made for a stunning display. More importantly, the project gave me a sense of ownership throughout the process and a surprisingly calming diversion during the wedding weekend. Even better, there was no need to freeze a couple of cakes for our one year anniversary. Rather than thawing cupcakes next August, I can simply whip up another batch (a single batch, thank you). * While I intended to make the filling, I nixed it at the very last minute. I guess I’m not that nuts. This left me with a refrigerator shelf full of mascarpone for a long, long time (which in turn left me with a very good reason to try Ina Garten’s Tiramisu). I also did not make the glaze, in lieu of Bailey’s Buttercream (below). Using an electric mixer, cream together all ingredients until very smooth. ** As I said in the post, I used cornstarch as a stabilizer because I was concerned about the heat in which the cupcakes would be displayed. The cornstarch did a great job of preventing meltage. We had an incredible time at your wedding. Everything, especially the homemade treats, was delectable. When you have kids they’ll be the envy of the rest of their camper peers on mail day. It’s wonderful that you could do this for your wedding! I think it’s awesome that you made your own wedding cupcakes. My mother basically nipped the idea in the bud for my own wedding (which is happening in June!). We just celebrated our one year anniversary and all that wedding planning is still fresh in my mind! While I didn’t quite have the guts (or, well, baking skills) to make my own cake, we too had cupcakes! My way of “owning” part of the planning process (besides well, doing most of it myself) was having Edible Arrangements for our centerpieces and encouraging the guests to consume large amounts of wonderfully fresh fruit. Mazel tov on the newly weddedness and have fun! A: Happy Anniversary! Your edible arrangements sound fun! MY GRAND-DAUGHTER WANTS CUPCAKES INSTEAD OF A CAKE AND SHE LED ME TO YOUR SITE. WHERE DO I GET THE LINERS AT? Ruth Ann: You can find them here. Good luck! Beautifully done! And congratulations! DH and I will celebrate 9 years next mo, and it really does get better and better. Will look into those beautiful liners for sis-in-laws bridal shower. They are so tasteful and elegant. luann: thanks! and congratulations on nine years. the liners would be lovely for a bridal shower. 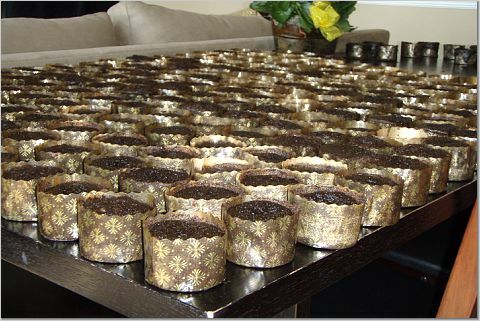 I am currently practicing this undertaking myself as I am baking the cupcakes for my brother’s wedding in November. It’s good to read that it is in fact possible because I’ve been having my doubts and panic moments! Your look beautiful! pipee: What a lovely thing to do for your brother! Good luck! These are lovely. My only question is how did you transport them all – where did you get boxes (were they inexpensive)? 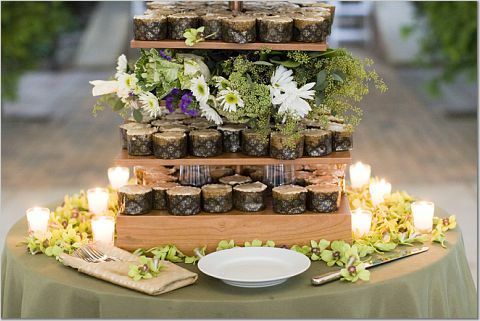 I want to do this for my own wedding next fall, but I am not sure how I would store 120+ cupcakes and then move them to the venue without ruining them. Arwen: I purchased (inexpensive — very) cake boxes online. From there, I ordered (only slightly more expensive, if memory serves) plastic trays to line the bottom of the boxes. 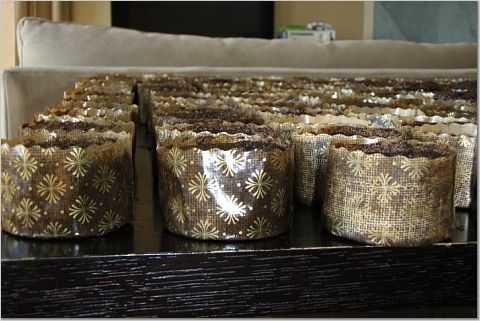 The trays had cupcake size indentations and served as “holders.” If you need more detailed information, feel free to email me directly (see the “About” page). I was searching for a cupcake display for our upcoming wedding, and stumbled across your page. I LOVE your display! Did you have it made or did you buy it? If it was purchased, where can I find one? I appreciate any guidance. I just read your blog and saw that your stepdad made the cupcake stand–it truly is gorgeous. Did he use a pattern? What did he use in the center of the stand, is it a wooden dowel? How many cupcakes did it hold? If it’s ok with you, I think I will ask my Grandpa to copy-cat your display! Thanks in advance for your time, Alisha. Alisha: Thanks for your comment. He created the design — so, no, he didn’t work from a pre-made pattern. There was a wooden dowel in the center and the layers actually slid on and off of it, so that it was easy to transport. Good luck with your project! I admire you for taking on the task of making the cupcakes yourself. I, too, am planning on making my own cupcakes. However, the thought of preparing 300+ cupcakes is a bit terrifying, but I have a 12 year old daughter (my maid of honor) and a 10 year old son (the best man) to help out, which I feel gives them a way to help mommy with the wedding and give this wedding a touch of them. Being so non-traditional in how the wedding will be, I had to go with the cupcakes. Not to mention the fact that the cheapest cake we could find that could accommodate 200+ people was close to $700!!! And I can make cupcakes for all these people for less than $200. CUPCAKES IT IS!!! More brides should consider making their cupcake wedding cakes, it adds a truly personal flair to the wedding reception and it is something that the guests will be talking about for ages! I wish you and hubby the very best!